ZEBULON, N.C. - The Carolina Mudcats, in conjunction with Minor League Baseball's "Copa de la Diversión" initiative celebrating Hispanic heritage and culture, announce today that they will play as "Pescados de Carolina" for four games during the upcoming 2019 season. Carolina's new Copa de la Diversión and Pescados de Carolina identity, complete with new game jerseys and hats, is presented locally by the Dental Center at Zebulon and nationally by ECHO Power Tools, the "Official Outdoor Power Tool of Copa de la Diversión" ("Herramienta Oficial de la Copa de la Diversión"). Copa de la Diversión, or "Fun Cup," is a season-long event series specifically designed by Minor League Baseball to embrace the culture and values that resonate most with local U.S. Hispanic/Latino communities. "We are very excited to participate in Minor League Baseball's Copa de la Diversión initiative this season" said Joe Kremer, Mudcats vice president and general manager. "We've certainly recognized the success of this initiative and felt it was important to our organization to embrace the cultures and values of our local Hispanic communities throughout the Five County region." The new Pescados de Carolina logo features a sugar skull fish and a unique color scheme, featuring aqua, orange, rose and black, in celebration of Mexican culture's Día de los Muertos holiday. The sugar skull fish embodies its Pescados alter ego, that represents a Mudcat (catfish) after it has been removed from the water. The Pescados will immerse themselves in the rich Latin culture found throughout the Carolinas, with a festive celebration at Five County Stadium. The Mudcats will transition to Pescados de Carolina for four home games this season starting on Friday, May 24 versus Down East with live music and a sugar skull bobblehead giveaway presented by O'Reilly Auto Parts. 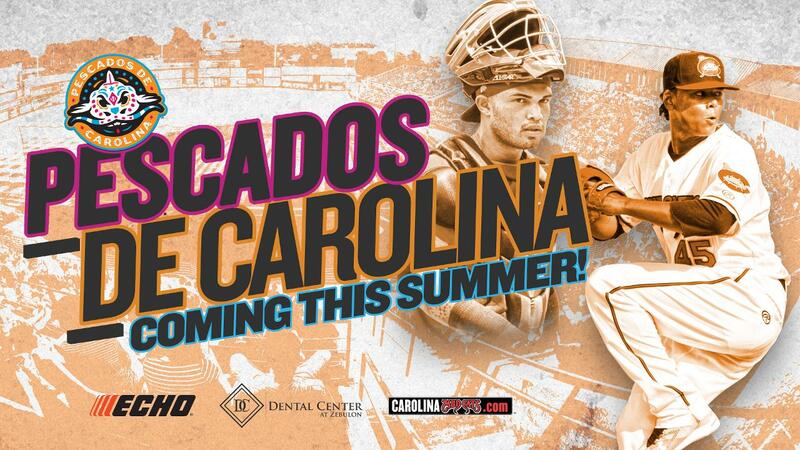 The Pescados de Carolina series of games continues on Friday, June 28 versus Potomac, Friday, July 19 versus Myrtle Beach and Friday, August 9 versus Salem. Each of the Copa de la Diversión and Pescados de Carolina games will be followed by postgame fireworks presented by House Autry. The new Pescados de Carolina brand identity will also have its own line of merchandise, including shirts and hats available both at the Tackle Box Team Store located at Five County Stadium and online at www.shopmudcats.com. The Mudcats have also created the Pescados de Carolina ticket plan, which includes tickets to all four Pescados de Carolina games (including the sugar skull bobblehead giveaway presented by O'Reilly Auto Parts), as well as tickets to Brewers Appreciation Night featuring a Jesus Aguilar bobblehead giveaway on Saturday, June 15 versus Winston-Salem. The Pescados de Carolina ticket plan is available at www.carolinamudcats.com and by calling (919) 269-CATS (2287). Carolina's 2019 season officially begins on Thursday, April 4 at Grainger Stadium in Kinston versus the Down East Wood Ducks. Carolina's 2019 home schedule, however, begins with Opening Night 2019 on Thursday, April 11 versus the Wilmington Blue Rocks at Five County Stadium. Season ticket packages as well as group ticket packages and the latest mini plans are all available now by visiting the Five County Stadium front office in Zebulon, by calling (919) 269-CATS (2287) and by visiting www.carolinamudcats.com.